For one day only, durian lovers are invited to enjoy an endless supply of the hugely popular D24 Durian McFlurry for only RM10. Durian lovers rejoice! Get ready to savour a free-flow of the irresistible D24 Durian McFlurry at all McDonald’s restaurants in Malaysia. On Tuesday, 17 July all McDonald’s restaurants in Malaysia will be setting aside two one-hour sessions dedicated to enjoying a well-known take on the king of fruits! The D24 Durian McFlurry is one of McDonald’s hottest-selling menu items. Made with vanilla soft serve mixed with real D24 durian, it is the perfect and ultimate treat for all durian fans. The two hourly sessions of this exclusive, never-before-held event will be from 3-4 pm and 5-6 pm at all McDonald’s restaurants. Registration starts at 2.30 pm for Session 1 and 4.30pm for Session 2 with customers having to pay only RM10 for each adult or child from ages 4 to 12. Little ones under the age of 3, but declare themselves durian lovers as well, can eat for free! Full payment is required before customers dive into the delicious, creamy goodness of the Durian McFlurry. 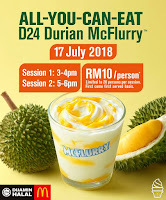 Customers lucky enough to join the sessions will be seated at a designated area in the restaurant and shall be entitled to unlimited refills of the D24 Durian McFlurry during each hourly session. 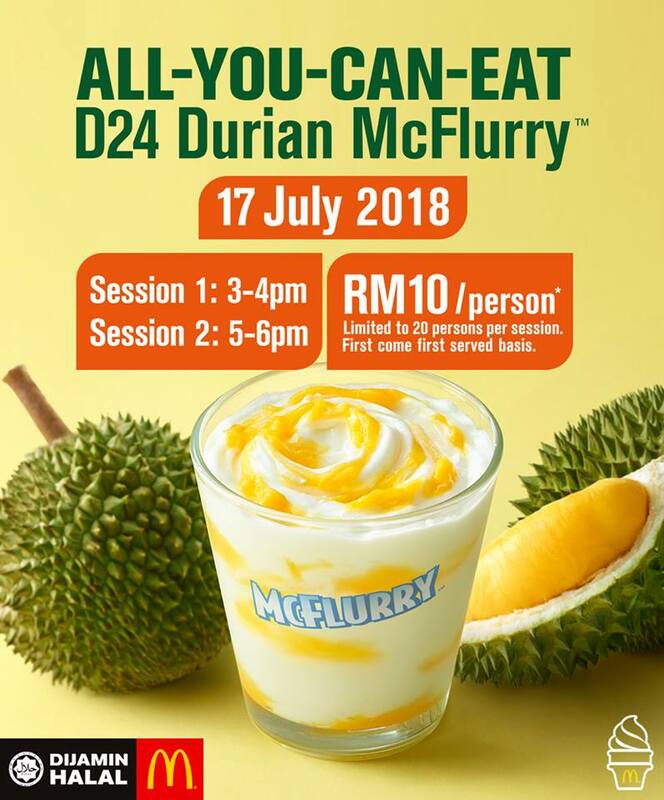 Fans of the D24 Durian McFlurry must take note that every hourly session is only limited to 20 persons on a first-come, first-served basis. This exclusive offer is valid for dine-in customers only. Those already craving for the taste of authentic D24 durian are encouraged to make plans on 17 July and come early.